The no roll, grease draining, easy clean sausage pan. Why is using a Sizzll pan so much better than how I currently cook sausages? The Sizzll pan, which is designed for grilling or baking sausages, involves less fat, less faff and therefore more fun. The patent pending shape ensures that you can rotate sausages during the cooking process to face the way that you want and hold them steady – so you don’t have the aggravation of them rolling around which leads to uneven cooking: some burnt, some undercooked. The sausages are raised up and any fat that comes out during the cooking process drains to 2 long collection areas below the sausages: a vast improvement on baking in a flat pan. When baking, the sausages are cooked much more evenly because of the shape of the pan: the sides are very low and the sausages are raised up out of the fat, which means that the heat moves around the sausages more evenly. The Sizzll pan is so easy to wash up: it fits in the sink (unlike your giant grill pan), has no dirt traps and after 5 mins of soaking the dirt from cooking is easy to wash away. Use a scourer if necessary on the stainless steel. And to add to it all, it fits neatly in standard dishwashers. How does a Sizzll pan stop the sausages from rolling? The reason that sausages roll around on a standard grill pan is generally because they curl up, even just a millimetre, when you heat them on one side only. After this has happened it is very difficult to get a sausage to face the orientation you want, which is frustrating! The patent pending profile of the Sizzll pan accommodates any shape of sausage: flat, mildly curved or very curved. 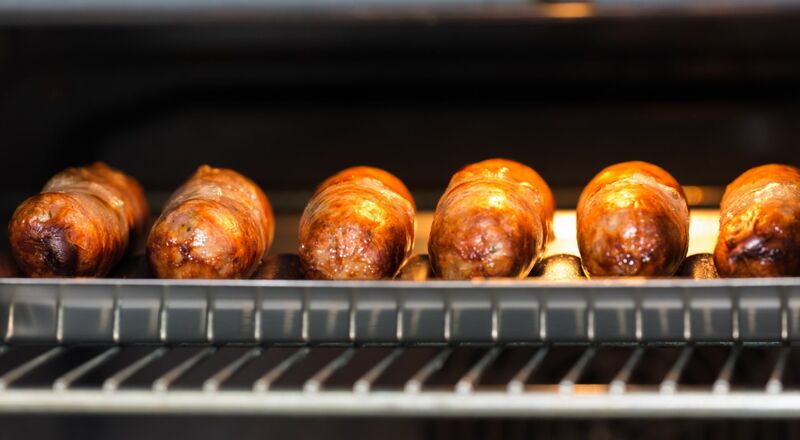 The sausages rest in their middle areas on the raised ‘bumps’ and the ends can rest downwards as required. Why is it so much easier to clean a Sizzll pan? The Sizzll pan is sized to fit in all standard sinks for easy soaking - five minutes lifts off almost all the dirt from the stainless steel because it only has smooth profiles. It is also sized to fit in the dishwasher to finish it off, leaving a really clean result. Proprietary oven cleaning products like Hob Brite also bring up a great finish where any stains appear, particularly after baking it several times. In contrast, the standard grill pan supplied with an oven is not easy to clean after you have grilled sausages – it is arguably the worst job in the kitchen! There are so many dirt traps and the overall pan doesn’t fit in the sink. As we have all experienced you end up with fatty water on your clothes and the wall around the sink! Where does the fat drain? The sausages are raised up and any fat that comes out during the cooking process drains to 2 long collection areas below the sausages: a vast improvement on baking in a flat pan. 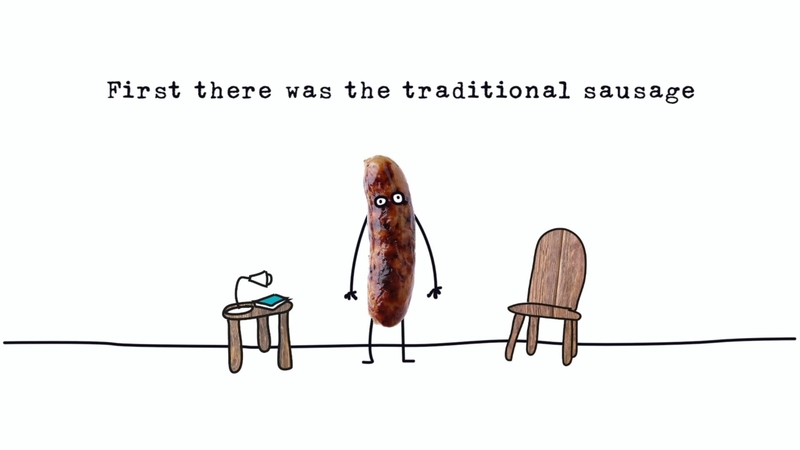 How many and what sized sausages can you cook? The Sizzll pan is sized so that 2 pans can be used side by side in standard ovens in both the grill area or on a shelf in the oven. Each pan has 8 locations for sausages. The pan has been designed to accommodate thin chipolatas up to large butcher sized sausages (max 4 oz / 100g per sausage).